It may seem improbable or even impossible that a vehicle could get better than the 2014 CR-V, yet the 2015 Honda CR-V changes are on display in our showroom at Central Illinois Honda Dealers show just that; this CR-V is better than ever before. So, let’s take a look at what’s happened to the CR-V to make it even more impressive. While there are plenty of small changes every model year, there is one update to the CR-V that makes it stand out not only above previous models but above competing crossovers. The 2015 CR-V has a brand new engine under the hood. The 2.4L four-cylinder engine is rated at 185 hp and 181 lb-ft of torque—that’s an increase in power over the previous model year. Each 2015 Honda CR-V 2WD model earns an EPA-estimated highway fuel economy of 34 mpg,* while the 2014 model only earned 31 highway mpg. Now, those two updates might be enough for you to get behind the wheel of the new CR-V, but this crossover is about more than just its engine. The 2015 CR-V also takes the idea of “standard features” to a whole new level, giving drivers access to some of the best in automotive technology at even the entry-level LX trim. Bluetooth HandsFreeLink: Connect your compatible smartphone to Honda’s i-MID infotainment system to make handsfree calls and stream audio. You can even connect directly to your Pandora account for your own custom stations. I-MID infotainment system: The Honda i-MID is an exclusive interface that lets you manage your CR-V’s cabin settings, music, and more. Rearview camera: The standard rearview camera with guidelines makes backing up and parallel parking simple and easy. And that’s just the start of the standard features; with four trim levels available, it’s easy to find the CR-V for you. We can spend all day telling you about what makes the 2015 Honda CR-V one of the most impressive vehicles in its class, but in the end, you really must take the vehicle for a test drive to experience it for yourself. 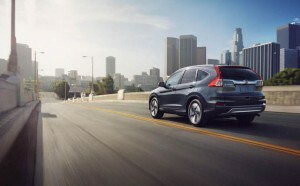 Visit a Central Illinois Honda Dealer near you to let us show you what the CR-V is capable of.